I been working with this nonprofit Hunts Point Alliance for Children. 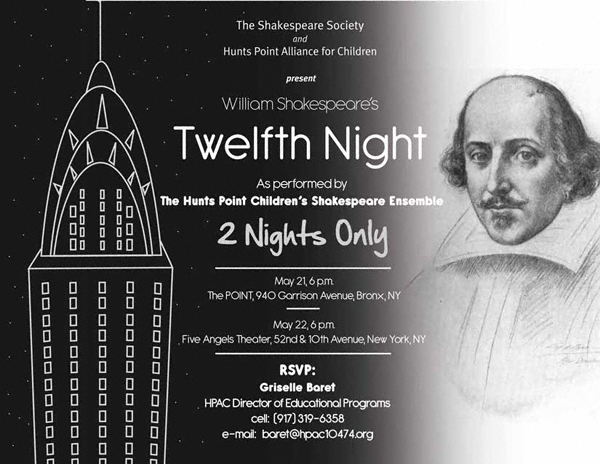 The children (12 -14 years of age) are going to perform Twelfth Night tonight in Bronx and tomorrow in Manhattan… Do you mind posting the link to the play? They have been working really hard and the money goes to a great charity. May 22, 2011 at 6:00 p.m. NOTE: While this show is free a R.S.V.P. is required!